Given that my hobbies, beading and knitting, call for me to be rounded over my projects, I am always looking for ways to balance my posture. We all spend too much time schlumped in front of a computer or steering wheel, bending over small children or the kitchen sink. I like the yoga eggs developed by Jason Scholder www.threeminuteegg.com because they conform to the natural shapes of my body better than the old yoga blocks. I put one for a pillow under my head. Two other yoga eggs go under my ribs. 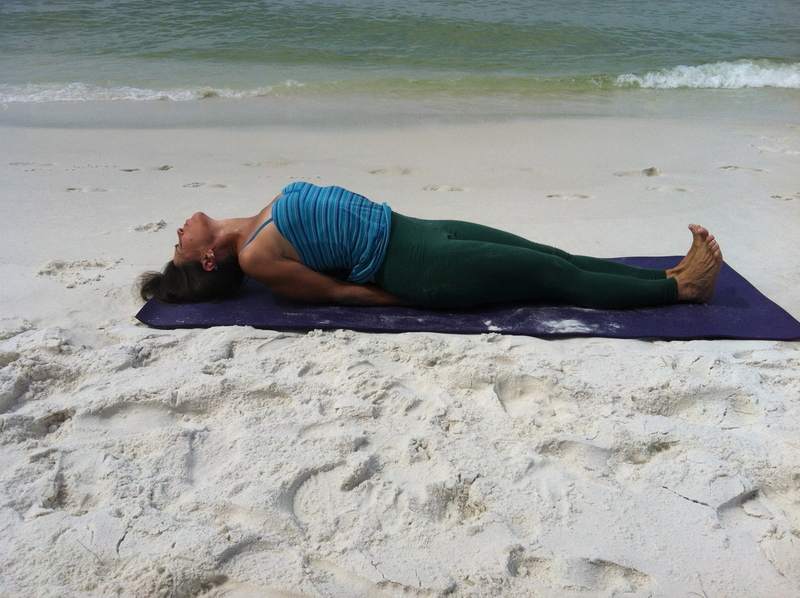 I lie back on the yoga eggs, arms at my side, chest rolled open, palms up. I stay there at least seven minutes. My chest opens and once again the energy is channelled into my heart and throat area. If I want an extra boost, I bring the soles of my feet together and rest my legs in butterfly (baddha konasana) position. In this position, I can feel a deep sense of rest and quiet. I can stay here and allow my energy to regenerate.